Results set 2: Recognition- Of the three images taken of each person, #1 and #3 are used to form a database to match against. Image #2 is then matched against those for recognition. Although the first guess by the program is always the correct one, some matches such as Lance, Kurt and Andyp would probably fall below our threshold of positive match. The errors in these cases are usually due to large variations in centering or the use of the flash in taking the picture. (Images in much higher contrast or 'oily' are ones that had the flash used). 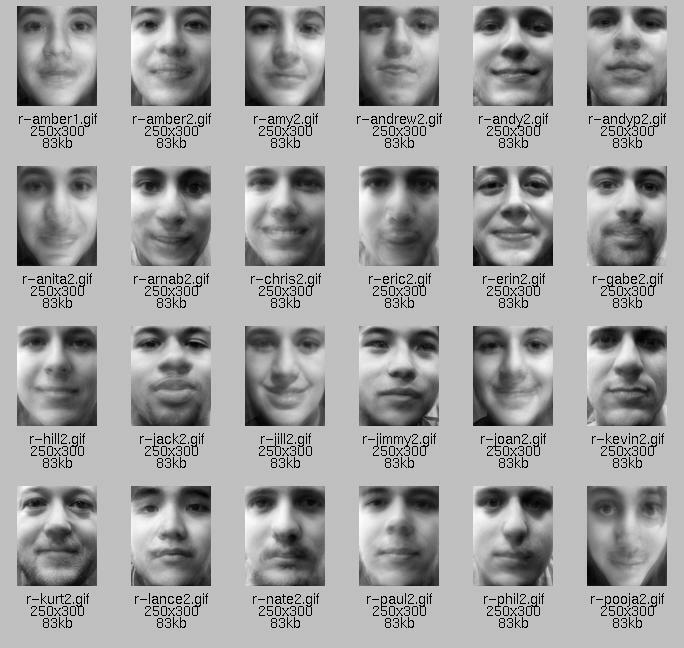 Results set 3: Progressive Reconstruction- This reconstruction goes from using 1 to 50 eigenfaces.